Thank you for contacting us. Our team will reach out to you momentarily. The Single Channel Cantilever Arm Bracket (IC/CARM/SC) is suitable for supporting light to medium loads. The single channel cantilever arm bracket is available in lengths from 150mm to 1200mm for supporting Speedway cable ladder and cable tray. Where heavier load carrying performance is required, the single channel cantilever arm bracket can be reinforced using a cantilever arm prop (IC/PROP/length/#) see page 213. 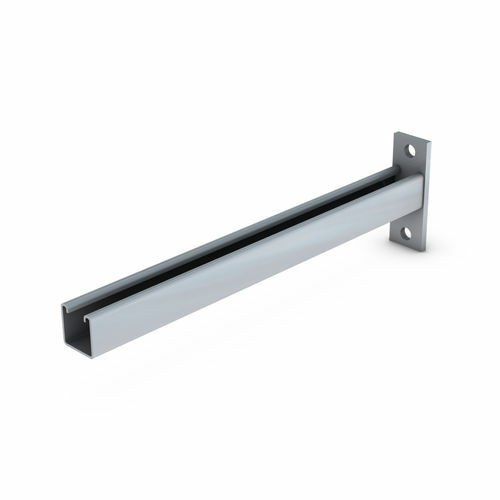 The single channel cantilever arm bracket, based on a conventional strut profile, is suitable for use with both external flange clamps (SW/EFC/#), adaptable fixing brackets (SW/AFB/#) and hold down brackets (SW/HDB/#) for Speedway Cable Ladder and for Cable Tray is suitable for use with the tray hold down bracket (HDB) or for direct fixing through the bed of the cable tray using conventional M6 channel nuts. The loading table below gives the recommended maximum load for each size of single channel cantilever arm bracket for supporting uniformly distributed loads (UDL) such as cable tray or for supporting Speedway cable ladder (which should be uniformly loaded to apply two equal point loads onto the cantilever arm). EUTEX International is unmatched in its complete electrical product and service offerings, including technical expertise, rapid product delivery, exceptional customer service and more.